Don’t wait for #BlackFriday. #BoycottMicrosoft WORLDWIDE now! Last July, the Washington Badass Teachers Association organized a protest demanding Bill and Melinda Gates divest from corporate education reform. WA BATs are organizing in protest of Bill Gates again, this time on Black Friday – November 28th. 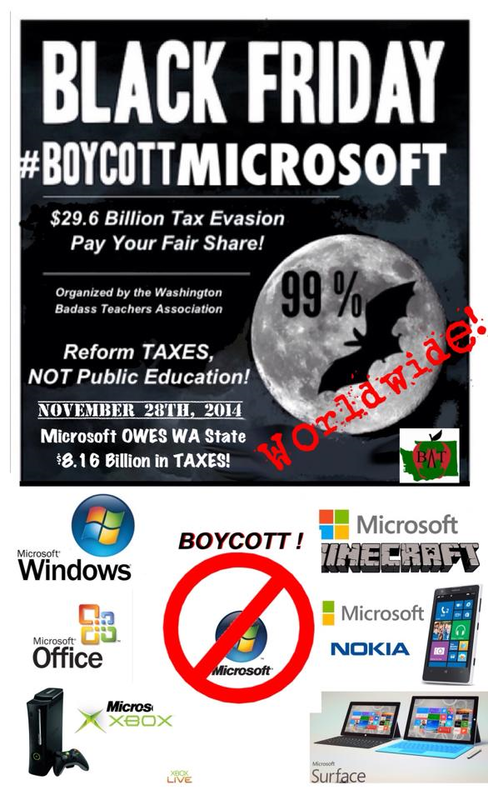 The WA BATs are organizing a WORLDWIDE #BoycottMicrosoft protest in response to Microsoft’s blatant tax evasion maneuvers. 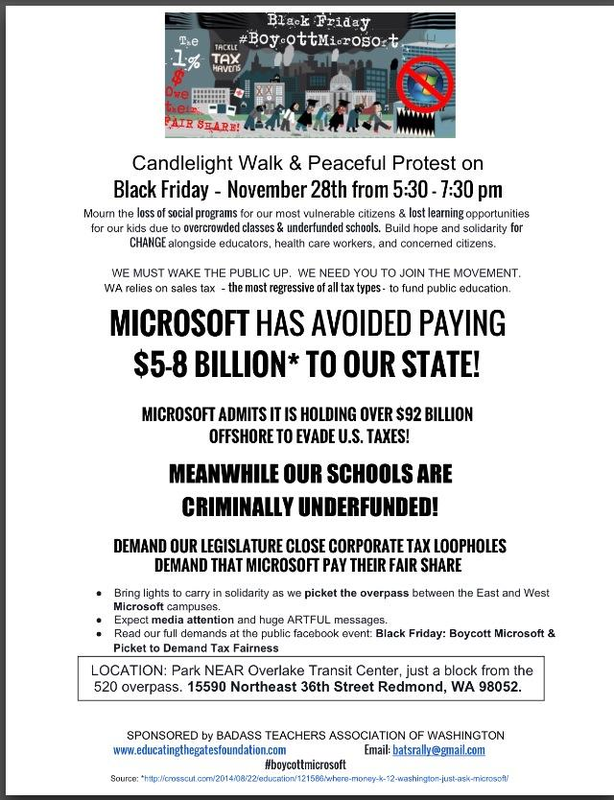 Sign up to join the Washington Badass Teachers Association #BlackFriday #BoycottMicrosoft Protest on their Facebook Event link here. 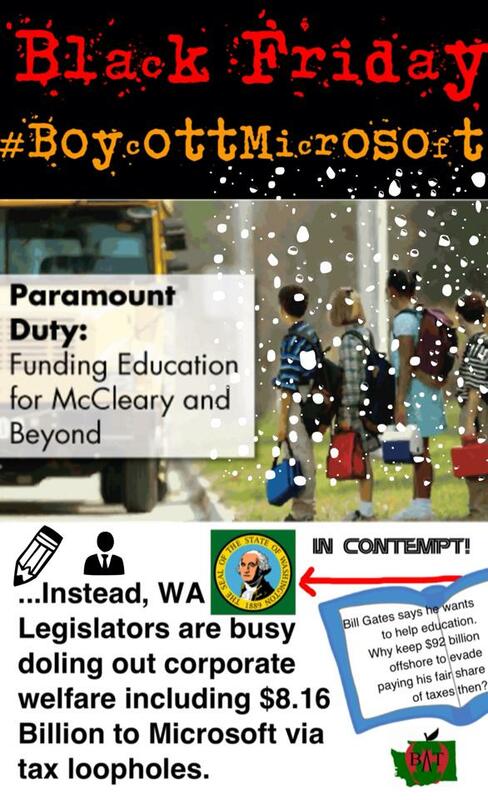 The protest unfolds in a climate where the Washington State Supreme Court has recently ruled the WA State Legislature is in contempt for breaking their constitutional oath to fully fund basic education as their “paramount duty“. But WHY #BoycottMicrosoft? 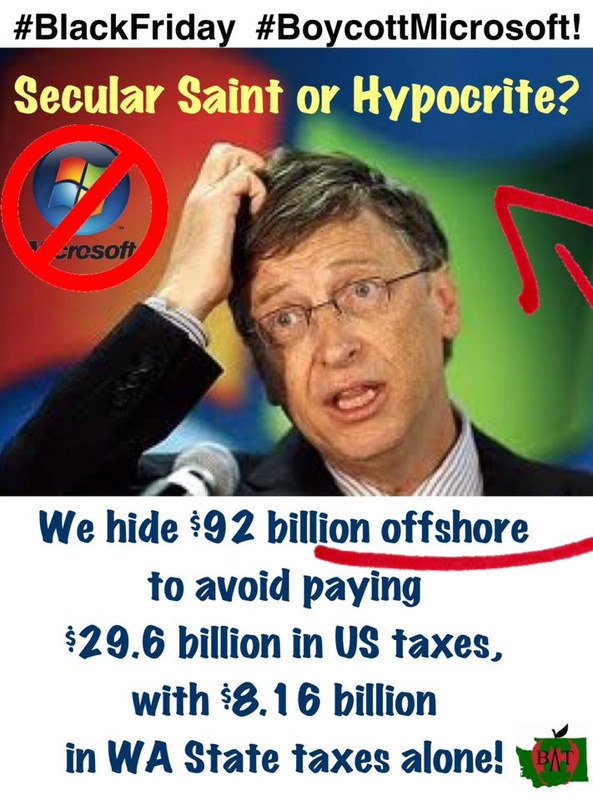 Legislators continue to favor corporate tax loopholes, while Bill Gates and Microsoft continue to intentionally shelter profits offshore in tax havens. In this candlelight vigil walking protest we carry a light for every child who didn’t get the attention their teacher wanted to give them because of criminal under-funding of schools. We mourn the learning opportunities lost in our classrooms because of tax loopholes and Microsoft’s intentional evasions. We mourn the loss of revenue for our most vulnerable citizens whom Bill Gates claims to protect. We are protesting tax loopholes given to – and taken by the wealthy. Microsoft is shirking their responsibility for meeting society’s needs and putting the tax burden on the backs of workers, thus perpetuating inequality (while profiting at record levels). But we aren’t just mourning passively. We are organizing against regressive unethical corporate greed! We have a clear struggle ahead of us and we have solidarity. “The left loves him as a rich man giving away much of his fortune for good causes. The right respects a business brain imposing financial rigour on a spendthrift aid sector. Charity chiefs and celebrities adore him, while politicians jostle to join him in the spotlight. Bill Gates claims he wants to help public education. Yet Microsoft intentionally avoids paying their fair share. Meanwhile they claim this has no significant impact on our state or the state’s economy. “Microsoft’s Executive Vice President and General Counsel Brad Smith acknowledged this practice and discussed its impact on Washington tax revenues in an interview I did with him in 2004.
Who is Microsoft fooling? Is this a boldface lie? How does such a thing happen in Washington State? Perhaps tax sheltered funds are used towards lobbying our congressmen/congresswomen and governors. For one, Neoliberal Governor Christine Gregoire appointed former Microsoft executive – Suzan DelBene – now Washington State Congresswoman as the Director of the Department of Revenue, that’s how. Our underfunded schools leave our most vulnerable citizens without the resources Bill Gates and the corporate refomers claim they wish to give and in fact do harm to them. Equitable funding is the real failure in our public schools. Instead of paying his taxes, Gates has invested billions on corporate education reform – almost all of which is through grants that have strings attached to accountability measures that induce a “Game of Thrones” stack ranking system much like he implemented into Microsoft. Microsoft employees were crushed by this system and it was recently dropped by the company as a result of harm to the company, yet he insists on using it on children, teachers, and schools. Gates is determined to use public education as his laboratory to experiment on other people’s children with his money for yet more profit. Meanwhile each experiment takes a terrible toll on students and teachers – especially our most vulnerable children. 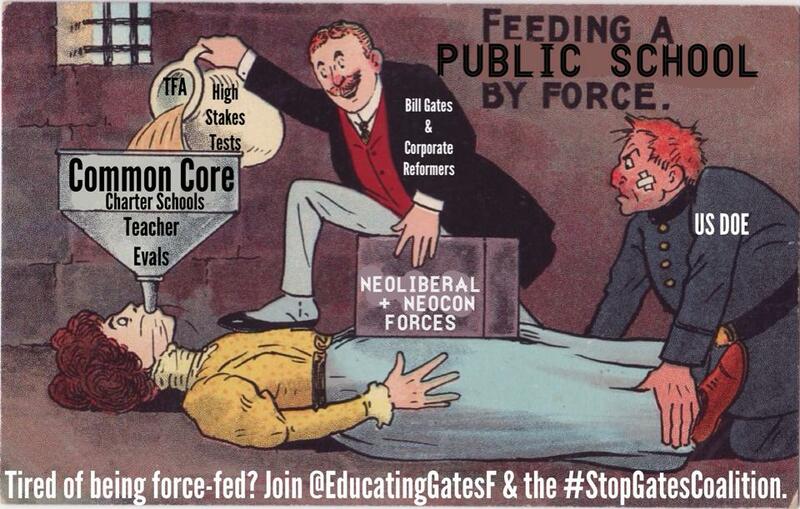 Gates has bankrolled Common Core, high stakes testing, charter schools, and teacher evaluations tied to test scores. He has bankrolled union busting even when evidence demonstrates children achieve at much higher rates in our nation’s unionized states. Gates and Microsoft have taken advantage of US schools for profit, yet they hide their profits offshore increasingly to avoid paying their fair share which in turn could help fully fund basic education across the US. So is this tax evasion legal? Maybe, according to David Sirota… but Sirota also acknowledges these are intentional maneuvers which threaten government budget deficits. To demonstrate just one of the ways Bill and Melinda Gates and Microsoft profit from education while evading paying taxes on their profits, consider Common Core alone. “Foremost among corporations already profiting from the CCSS are Bill Gates’ Microsoft and British-based Pearson Inc. Both spent years channeling corporate funds through not-for-profit “charities” — the Bill and Melinda Gates Foundation and the Pearson Foundation, respectively — to champion the development and promotion of Common Core and to create a marketplace for their education technology. Gates Foundation spokespeople tout the CCSS as a “step to greater excellence in education,” but this latest round of federally imposed educational testing is really designed to secure new markets for technical and computerized educational materials. The Gates Foundation spent over $170 million to manipulate the U.S. Department of Education to impose the CCSS, knowing it would realize a return on this investment as school districts and parents rush to buy the technology products they’ve been convinced are vital to improving education. Ironically, the profits from Microsoft licensing paid by public school districts via taxpayer money are the same profits Microsoft evades paying taxes on in Washington State. Just imagine the profits from licensing all of the school districts who have Windows and Microsoft Office installed on their computers by reading the costs to one district alone below. Microsoft was accused of bullying Oregon and Washington public schools in 2002 in this article – Schools cry bully over Microsoft licensing fees. ‘The company also changed its stand-alone licenses and now forces schools to pay full retail cost for many upgrades. All of those changes mean schools can expect to pay Microsoft more now than in the past, regardless of the type of licensing agreement they sign. Corporate Welfare or Robbing the Poor to Give to the Rich? What does Bill Gates have to say about corporations paying their fair share? Funny how he forgets about the lobbying and choices he makes, putting all the blame on legislators. So much for ethics. What does Bill Gates say about Black Friday? Your charity does not cover up the harm done by not paying your fair share of taxes to help the worlds’ most vulnerable, Mr. and Mrs. Gates. 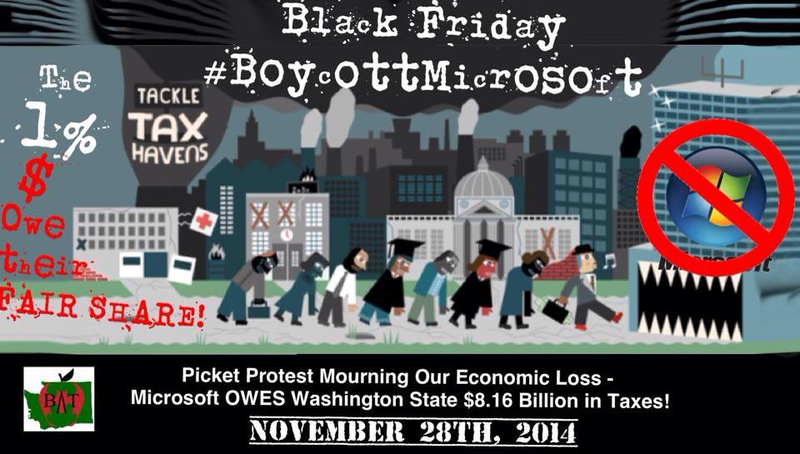 Why is #BoycottMicrosoft important for Washington State? “In 2010, Microsoft earned $62.5 billion. If Microsoft Nevada recorded more than $30 billion a year from software licensing, that meant licensing had grown to make 50 percent of its total yearly revenues — much more than its final public disclosure of 31.6 percent in 2003. That number would make sense considering the company’s rapid migration from retail software packages to bulk licensing deals with PC manufacturers and Fortune 500 customers. We are many. The 1% are few. Organize. 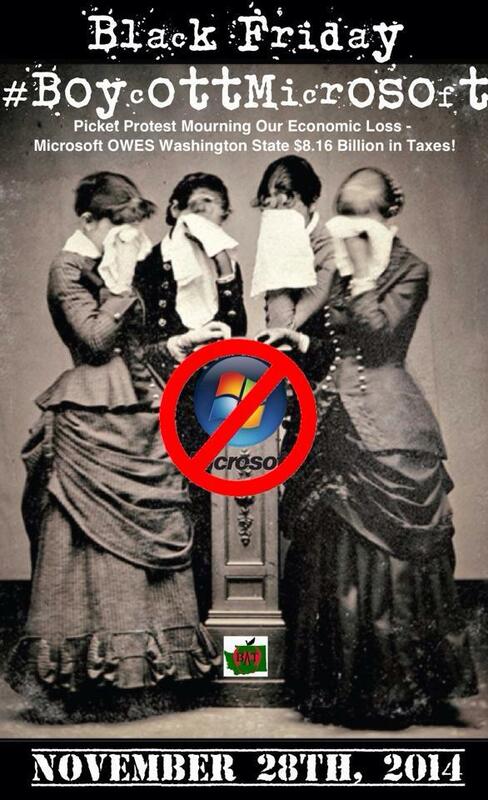 #BoycottMicrosoft Worldwide! Why #BoycottMicrosoft WORLDWIDE? Read Ian Birrell’s report on the GLOBAL implications of Microsoft’s tax evasions here. Clearly, the lost revenue created by unethical decisions made by the world’s richest man need to be actively challenged. Does Bill Gates really want to help public education? Then be ethical. 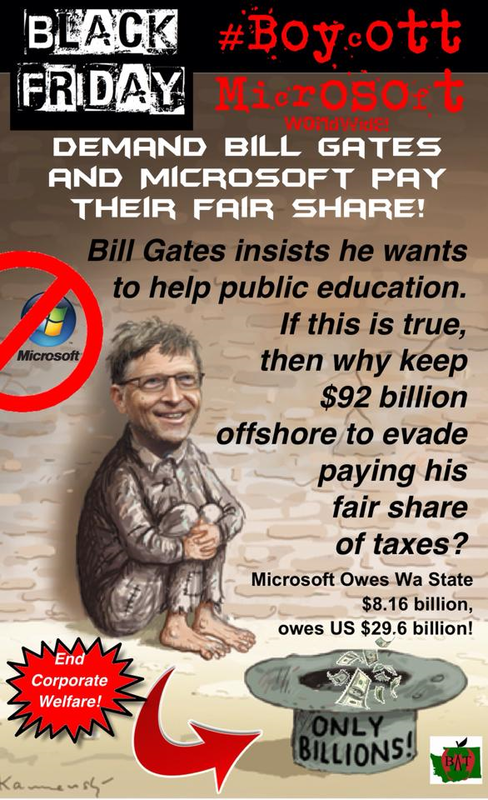 Microsoft and Bill Gates – pay your fair share! Don’t wait for #BlackFriday. Don’t stop on #BlackFriday. Don’t stop until Bill Gates and Microsoft pay their fair share! Readers, how can you help organize a #BoycottMicrosoft Protest worldwide? Here is our flyer. Send us YOURS!